Francisco de Goya was the most important Spanish painter of the second half of the 18th century and the beginning of the 19th century. His works range from Rococo to Romanticism as well as his paintings are considered the anticipation of Impressionism, Surrealism and Expressionism. A) 1774-1792 TAPESTRY CARTOONS AND PORTRAITS His first works were frescoes for the vault of the Basilica of El Pilar. His brother in law, Francisco Bayeu, introduced him in the court and soon Goya was hired as cartoon painter in the Royal Tapestry Factory in Madrid. His work consisted in drawing sketches for the weavers to embroider. He painted happy and popular scenes such the Gallinita Ciega (Blind Man´s Bluff) or the Parasol as well as the series of the four seasons. He gained a good reputation so he joined the Royal Academy and was appointed as court painter by Charles IV (1789). B) 1792-1814 PORTRAITS, PAINTINGS AND ENGRAVINGS. After a long disease, he became deaf and his production changed radically as well as his style. He left the tapestry cartoons and concentrated on painting portraits such as the portrait of Charles IV and his family, the Duchess of Alba, the Majas, The Countess of Chinchón. Many of these works had loose brushstrokes, different types of capturing light and described personality of the portrayed figures. His engravings showed criticism to the society he lived in and his most important series were Los Caprichos which anticipates surrealism. 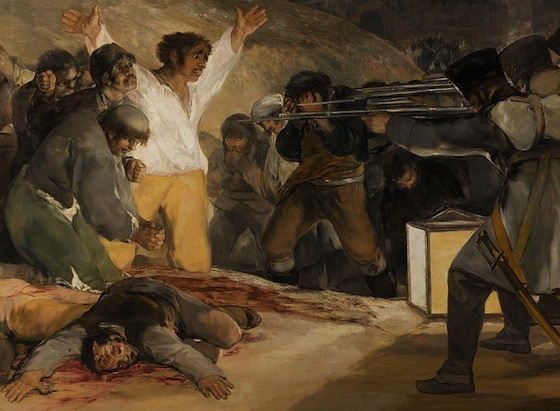 During the War of Independence, he depicted the violence of the conflict in the Second of May 1808 or the Executions. He also showed the brutality of the war in his engravings compiled in the Disasters of the War. 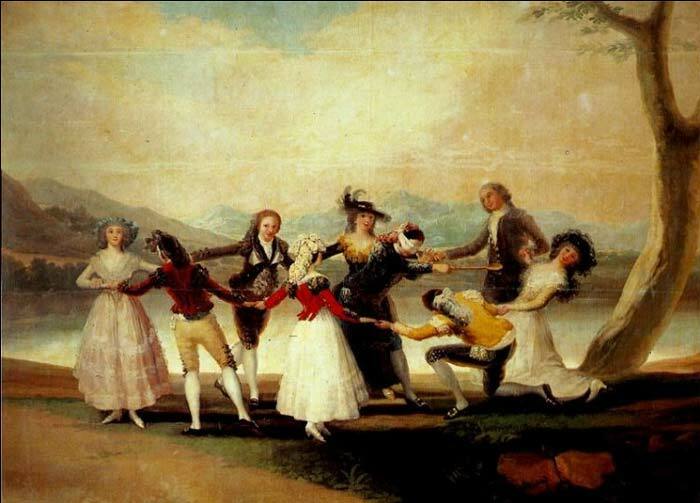 C) 1814-1828 BLACK PAINTINGS AND EXILE Once the war finished and Ferdinand VII restablished the absolutism, Goya retired to his country house near Manzanares river and the decorated its walls with black paintings which used dark colors as well as the topics were raw and violent. Saturn devouring his son and witches were the themes represented in his frescoes. The strong gestures and expressions are considered as the precedent of Expressionism. During the war, Goya was considered an afrancesado so he went on exile in 1824. He established in France and recovered his interest for beauty, bright colors and light with free brushstrokes which connected him with Romanticism and Impresionism.